Last Sunday was a tough morning for just about everyone. The hills hit you hard right off the bat, then continued by the Spot Pond accompanied by some hot sunshine, then when you finally found some shade you had another set of hills to get through. Well this week will be completely different! This week we recover from that run with a shorter, flatter route (could it get any hillier… yes it can, but not this week). We’ll head north straight up Main St into Wakefield. Three miles in you’ll hit the water stop, on the right side of the road right after Dunkin Donuts. You’ll find me there with my bucket full of gatorade and water to get you ready for the next section of the run. If you’re running the shorter distance, turn around and go back. That’s it! Longer, continue up Main St you’ll go through Wakefield Center, stay on the right side of the road because after the center there will be a fork where you stay right on Main St. This will bring you up to the east side of Lake Quannapowitt. This run will circle the lake, turning left onto Rt129, left through the Converse parking lot all the way over to North Ave. North Ave will bring you down to a softball field where you turn left onto Church St. Church St will bring you to… wait for it… a church. Turn right at the church and it will bring back up to Wakefield Center and on to the water stop. Another drink, perhaps a snack, and boom, you’re on your way back to Brueggers and done for the day. Nice and easy! I’ve got the water stops covered so we’ll see you in the AM, 8AM that is, who’s in? ROLL CALL! Week 1 started us off with a decent crowd of 20 runners on a hot and humid Saturday morning. The group was a mix of return long runners, some veteran club runners joining in with us for the first time, and some bright cheery new faces eager to get some miles in with us. The run included 2 bonus water stops for a total of 3 over 8.8 miles. Almost every runner was more than happy to take the extra breaks to replenish lost fluids and get them through the run. And for the record the radar sign record is 13 MPH set by Mary Corbett, Wayne Higgins, and me back in August of 2009. They both have been relocated to the West Coast so I could be the only remaining member of the record setting team left to boast about it. Nobody reported any speeds this run but you’ll have a few more chances at that sign over the next 13 weeks. This Sunday we’ll be hitting the roads at 8AM from Brueggers again! The route will take us south on Main St and right onto West Wyoming Ave. When you hit the lights at Grimsby’s you’ll head left onto the Fellsway. Here you’ll find marvelous wooded hills to carry you over to the rotary at Highland Ave. Go right at the paper boy and head up to Water Stop 1. After the water stop you’ll go one of two ways: shorter route runners bear right at the rotary, longer routers go left. 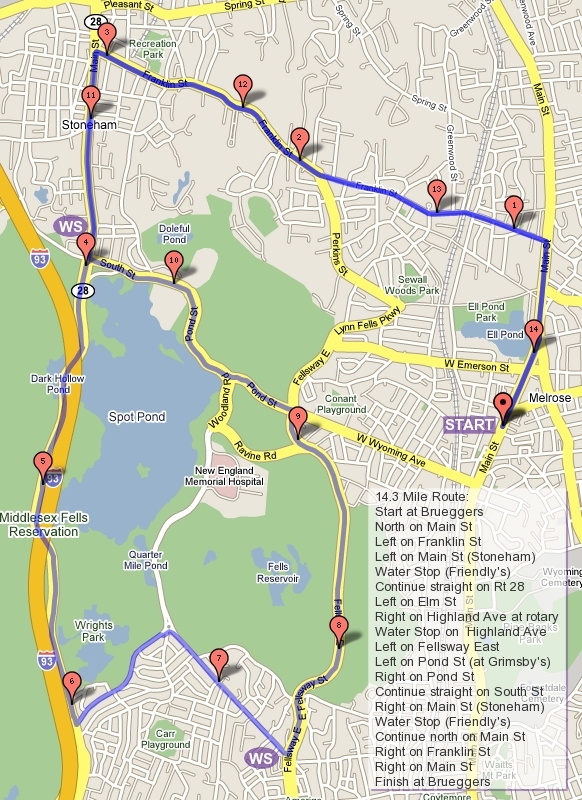 The half training route will take you along the eastern side of Spot Pond, which we’ll call the front side of the pond. You’ll pass an old hospital on the right, water works on your left, and then hit a little traffic island at Pond St. Head right down the steep winding path along Pond St back to Grimsby’s, take a left through a few hills on the LynnFells Parkway, pass the Melrose Middle School and High School, cut the corner at Melrose St up to Main St and back to Brueggers. The full training route travels down Elm St to the Fellsway West. Turn right there and head up a series of a few hills, the first of which we’ve dubbed Slackers Hill where you might find a few people walking. Don’t walk! Run along this road under Rt 93 and then back over Rt 93, past an off ramp from Rt 93, where you’ll take a right onto a little road with parking at Straw Point at Spot Pond. If you make it to an intersection with a Friendly’s and a Mobil you missed the right turn, but turn right there and you’ll get back on track. Sometimes there is a water stop at Straw Point. If so grab a drink, if not keep on running. This little road will take you to Pond Street in Stoneham. Following that to the right will take you past the Stone Zoo. Take a gander at the animals as you go by. You’ll continue past the pond, past the water works, past the hospital, past the hockey rink, and back to the water stop near the rotary. Drink some more and head on out for the last stretch. On this stretch you’ll leave the water stop and take a quick left onto East Border Road. Enjoy the uphill here where you’ll hear echos of people cursing me from training seasons past. Feel free to add your own choice words. This hill will take you to an intersection where you take a left back onto the Fellsway East. Those hills you didn’t like on the way out, you can not like them on the way back. They’ll take you to Grimsby’s, keep going straight here to the LynnFells Parkway and… wait for it… another hill! The parkway will bring you to Melrose Middle School, Melrose High School to Melrose Street. A right turn here will take you right up to Main St. A right on Main Street will take you right back to Brueggers and you’ll be done! Sound Fun? Most of this route was part of the Law Enforcement Half Marathon which grew up and moved out to become Boston’s Run to Remember, so I’m not to blame for the design of the course. Water Stops: I’ll take care of them again this Sunday, although I could use a car at Straw Point to throw some supplies in. If anyone wants to park there and catch a ride from someone to the start, I’ll dump the supplies there during the run. Volunteers? Ok, we had 20 last week, let’s get more this week! Who’s in? ROLL CALL! Week 1 – The Fall 2012 Training Season Begins! It’s that time again! When thoughts of cool, crisp autumn morning races start to fill the heads of little runners everywhere. If you want to be ready for those races you’ll have to start training in the hot, humid summer months though. So meet us Saturday Morning (YES SATURDAY MORNING) for the first of (at least) 14 training runs for fall marathons and halfs. If you haven’t done this before, here’s how it works. Show up at Brueggers every Sunday (unless I tell you its Saturday like it is this week) and hand me $2 if you are running the long run or $1 if you’re running the short run. This money is for water stop supplies. Some weeks you’ll drink and eat less than your moneys worth but believe me there will be others that you eat much more than your money’s worth. After handing me your money I’ll go over the route. If you’re unfamiliar with the route print out a map and bring it with you (in a plastic bag works best because it will get damp). After I go over the route I’ll absolve myself of all responsibility for your sense of direction and send you out onto the streets. Just follow the person in front of you and if you know where you’re going watch for the person behind you. In the history of the Sunday Long Run we haven’t lost anyone… for more than an hour or so. Run the run, finish at Brueggers, grab some coffee and a snack and socialize with other runners. This is the best way to pick up training and racing tips from other runners. If you have any questions look at the About link up in the right corner there or post your question here. This week will be doing 8.8 miles for the full route and 4.2 for the half route. The route will take us north on Main St, cutting over on Green St to LynnFells Parkway headed towards Saugus. When we reach the set of lights at Main St in Saugus go left. If you’re running the short route you can go left on Howard St back to Green and Main back to Brueggers. If you’re running longer keep going on Main St through some hills until you reach Wakefield High School. If you’re up to the challenge, right before the High School is a Speed Limit radar sign, if three or more runners run in a tight pack they can trip the radar and go for the record. Give it a try, tell me what you did and I’ll let you know if you beat the record. At the High School you’ll hit the official water stop for the run. Enjoy a cool drink and head out for more. Continue straight to the end of what is now Farm St, turn left on Water Street, left on Main St in Wakefield Center, and back on home along Main to Brueggers. That’s it. Also if you’re new here, here’s where I ask who’s coming. This helps me plan the amount of supplies needed for the water stops. Don’t be shy, let me know! Who’s in?! ROLL CALL!!! !